Art historians attempt to classify medieval art into major periods and styles, often with some difficulty. A generally accepted scheme includes the later phases of Early Christian art, Migration Period art, Byzantine art, Insular art, Pre-Romanesque, Romanesque art, and Gothic art, as well as many other periods within these central styles. In addition each region, mostly during the period in the process of becoming nations or cultures, had its own distinct artistic style, such as Anglo-Saxon art or Viking art. Medieval art was produced in many media, and works survive in large numbers in sculpture, illuminated manuscripts, stained glass, metalwork and mosaics, all of which have had a higher survival rate than other media such as fresco wall-paintings, work in precious metals or textiles, including tapestry. Especially in the early part of the period, works in the so-called "minor arts" or decorative arts, such as metalwork, ivory carving, enamel and embroidery using precious metals, were probably more highly valued than paintings or monumental sculpture. Medieval art in Europe grew out of the artistic heritage of the Roman Empire and the iconographic traditions of the early Christian church. These sources were mixed with the vigorous "barbarian" artistic culture of Northern Europe to produce a remarkable artistic legacy. Indeed, the history of medieval art can be seen as the history of the interplay between the elements of classical, early Christian and "barbarian" art. Apart from the formal aspects of classicism, there was a continuous tradition of realistic depiction of objects that survived in Byzantine art throughout the period, while in the West it appears intermittently, combining and sometimes competing with new expressionist possibilities developed in Western Europe and the Northern legacy of energetic decorative elements. The period ended with the self-perceived Renaissance recovery of the skills and values of classical art, and the artistic legacy of the Middle Ages was then disparaged for some centuries. Since a revival of interest and understanding in the 19th century it has been seen as a period of enormous achievement that underlies the development of later Western art. The Middle Ages in Europe saw a decrease in prosperity, stability, and population in the first centuries of the period—to about 800 AD, and then a fairly steady and general increase until the massive setback of the Black Death around 1350, which is estimated to have killed at least a third of the overall population in Europe, with generally higher rates in the south and lower in the north. Many regions did not regain their former population levels until the 17th century. The population of Europe is estimated to have reached a low point of about 18 million in 650, to have doubled around the year 1000, and to have reached over 70 million by 1340, just before the Black Death. In 1450 it was still only 50 million. To these figures, Northern Europe, especially Britain, contributed a lower proportion than today, and Southern Europe, including France, a higher one. The increase in prosperity, for those who survived, was much less affected by the Black Death. Until about the 11th century most of Europe was short of agricultural labour, with large amounts of unused land, and the Medieval Warm Period benefited agriculture until about 1315. At the start of the medieval period most significant works of art were very rare and costly objects associated with secular elites, monasteries or major churches and, if religious, largely produced by monks. By the end of the Middle Ages works of considerable artistic interest could be found in small villages and significant numbers of bourgeois homes in towns, and their production was in many places an important local industry, with artists from the clergy now the exception. However the Rule of St Benedict permitted the sale of works of art by monasteries, and it is clear that throughout the period monks might produce art, including secular works, commercially for a lay market, and monasteries would equally hire lay specialists where necessary. The impression may be left by the surviving works that almost all medieval art was religious. This is far from the case; though the church became very wealthy over the Middle Ages and was prepared at times to spend lavishly on art, there was also much secular art of equivalent quality which has suffered from a far higher rate of wear and tear, loss and destruction. The Middle Ages generally lacked the concept of preserving older works for their artistic merit, as opposed to their association with a saint or founder figure, and the following periods of the Renaissance and Baroque tended to disparage medieval art. 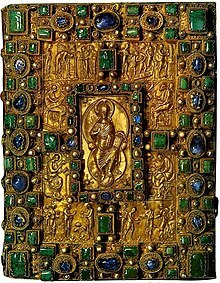 Most luxury illuminated manuscripts of the Early Middle Ages had lavish treasure binding book-covers in precious metal, ivory and jewels; the re-bound pages and ivory reliefs for the covers have survived in far greater numbers than complete covers, which have mostly been stripped off for their valuable materials at some point. Early Christian art, more generally described as Late Antique art, covers the period from about 200 (before which no distinct Christian art survives), until the onset of a fully Byzantine style in about 500. There continue to be different views as to when the medieval period begins during this time, both in terms of general history and specifically art history, but it is most often placed late in the period. 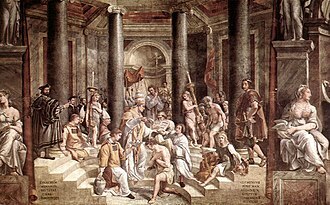 In the course of the 4th century Christianity went from being a persecuted popular sect to the official religion of the Empire, adapting existing Roman styles and often iconography, from both popular and Imperial art. 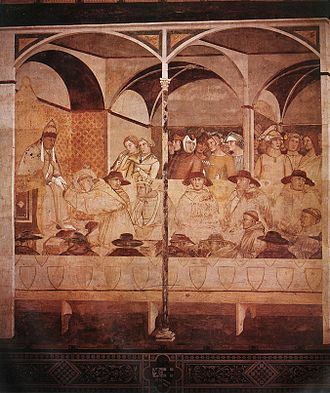 From the start of the period the main survivals of Christian art are the tomb-paintings in popular styles of the catacombs of Rome, but by the end there were a number of lavish mosaics in churches built under Imperial patronage. Over this period imperial Late Roman art went through a strikingly "baroque" phase, and then largely abandoned classical style and Greek realism in favour of a more mystical and hieratic style—a process that was well underway before Christianity became a major influence on imperial art. Influences from Eastern parts of the Empire—Egypt, Syria and beyond, and also a robust "Italic" vernacular tradition, contributed to this process. Figures are mostly seen frontally staring out at the viewer, where classical art tended to show a profile view - the change was eventually seen even on coins. The individuality of portraits, a great strength of Roman art, declines sharply, and the anatomy and drapery of figures is shown with much less realism. The models from which medieval Northern Europe in particular formed its idea of "Roman" style were nearly all portable Late Antique works, and the Late Antique carved sarcophagi found all over the former Roman Empire; the determination to find earlier "purer" classical models, was a key element in the art all'antica of the Renaissance. Byzantine art was extremely conservative, for religious and cultural reasons, but retained a continuous tradition of Greek realism, which contended with a strong anti-realist and hieratic impulse. After the resumption of icon production in 843 until 1453 the Byzantine art tradition continued with relatively few changes, despite, or because of, the slow decline of the Empire. 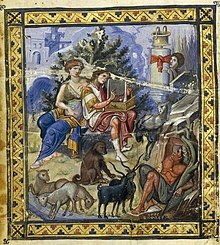 There was a notable revival of classical style in works of 10th century court art like the Paris Psalter, and throughout the period manuscript illumination shows parallel styles, often used by the same artist, for iconic figures in framed miniatures and more informal small scenes or figures added unframed in the margins of the text in a much more realist style. Monumental sculpture with figures remained a taboo in Byzantine art; hardly any exceptions are known. 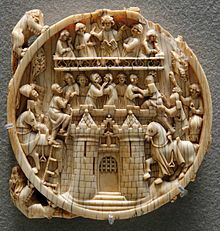 But small ivory reliefs, almost all in the iconic mode (the Harbaville Triptych is of similar date to the Paris Psalter, but very different in style), were a speciality, as was relief decoration on bowls and other metal objects. The Byzantine Empire produced much of the finest art of the Middle Ages in terms of quality of material and workmanship, with court production centred on Constantinople, although some art historians have questioned the assumption, still commonly made, that all work of the best quality with no indication as to origin was produced in the capital. 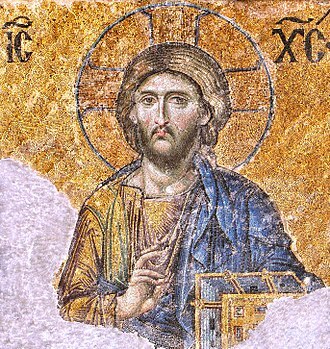 Byzantine art's crowning achievement were the monumental frescos and mosaics inside domed churches, most of which have not survived due to natural disasters and the appropriation of churches to mosques. Byzantine art exercised a continuous trickle of influence on Western European art, and the splendours of the Byzantine court and monasteries, even at the end of the Empire, provided a model for Western rulers and secular and clerical patrons. For example, Byzantine silk textiles, often woven or embroidered with designs of both animal and human figures, the former often reflecting traditions originating much further east, were unexcelled in the Christian world until almost the end of the Empire. These were produced, but probably not entirely so, in Imperial workshops in Constantinople, about whose operations we know next to nothing—similar workshops are often conjectured for other arts, with even less evidence. Some other decorative arts were less developed; Byzantine ceramics rarely rise above the level of attractive folk art, despite the Ancient Greek heritage and the impressive future in the Ottoman period of İznik wares and other types of pottery. The Coptic art of Egypt took a different path; after the Coptic Church separated in the mid-5th century it was never again supported by the state, and native Egyptian influences dominated to produce a completely non-realist and somewhat naive style of large-eyed figures floating in blank space. This was capable of great expressiveness, and took the "Eastern" component of Byzantine art to its logical conclusions. Coptic decoration used intricate geometric designs, often anticipating Islamic art. Because of the exceptionally good preservation of Egyptian burials, we know more about the textiles used by the less well-off in Egypt than anywhere else. These were often elaborately decorated with figurative and patterned designs. Other local traditions in Armenia, Syria, Georgia and elsewhere showed generally less sophistication, but often more vigour than the art of Constantinople, and sometimes, especially in architecture, seem to have had influence even in Western Europe. For example, figurative monumental sculpture on the outside of churches appears here some centuries before it is seen in the West. 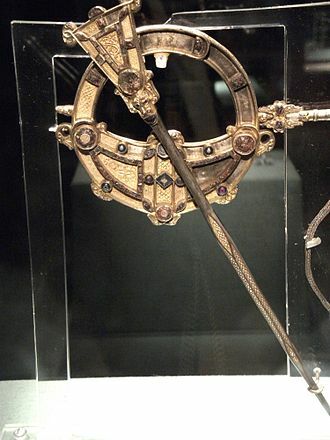 Shoulder-clasp from Sutton Hoo, Anglo-Saxon, c. 620. Interlaced biting snakes and confronted boars (end sections) are depicted entirely schematically. Migration Period art describes the art of the "barbarian" Germanic and Eastern-European peoples who were on the move, and then settling within the former Roman Empire, during the Migration Period from about 300-700; the blanket term covers a wide range of ethnic or regional styles including early Anglo-Saxon art, Visigothic art, Viking art, and Merovingian art, all of which made use of the animal style as well as geometric motifs derived from classical art. By this period the animal style had reached a much more abstracted form than in earlier Scythian art or La Tène style. Most artworks were small and portable and those surviving are mostly jewellery and metalwork, with the art expressed in geometric or schematic designs, often beautifully conceived and made, with few human figures and no attempt at realism. 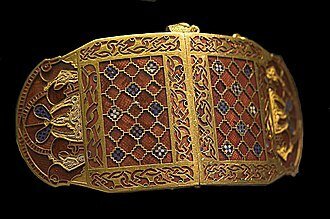 The early Anglo-Saxon grave goods from Sutton Hoo are among the best examples. 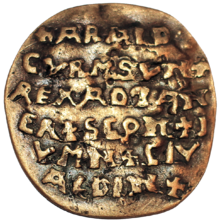 As the "barbarian" peoples were Christianized, these influences interacted with the post-classical Mediterranean Christian artistic tradition, and new forms like the illuminated manuscript, and indeed coins, which attempted to emulate Roman provincial coins and Byzantine types. Early coinage like the sceat shows designers completely unused to depicting a head in profile grappling with the problem in a variety of different ways. As for larger works, there are references to Anglo-Saxon wooden pagan statues, all now lost, and in Norse art the tradition of carved runestones was maintained after their conversion to Christianity. 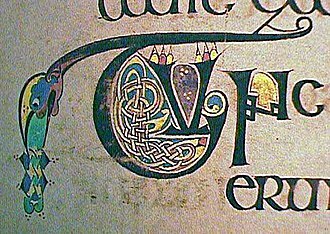 The Celtic Picts of Scotland also carved stones before and after conversion, and the distinctive Anglo-Saxon and Irish tradition of large outdoor carved crosses may reflect earlier pagan works. Viking art from later centuries in Scandinavia and parts of the British Isles includes work from both pagan and Christian backgrounds, and was one of the last flowerings of this broad group of styles. Islamic art during the Middle Ages falls outside the scope of this article, but it was widely imported and admired by European elites, and its influence needs mention. Islamic art covers a wide variety of media including calligraphy, illustrated manuscripts, textiles, ceramics, metalwork and glass, and refers to the art of Muslim countries in the Near East, Islamic Spain, and Northern Africa, though by no means always Muslim artists or craftsmen. Glass production, for example, remained a Jewish speciality throughout the period, and Christian art, as in Coptic Egypt continued, especially during the earlier centuries, keeping some contacts with Europe. 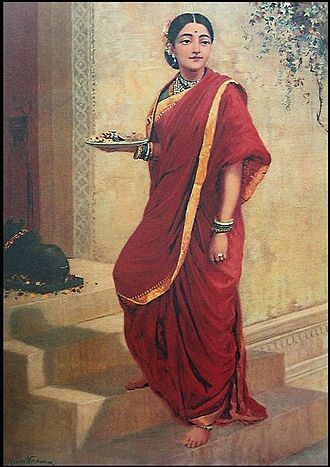 There was an early formative stage from 600-900 and the development of regional styles from 900 onwards. Early Islamic art used mosaic artists and sculptors trained in the Byzantine and Coptic traditions. Instead of wall-paintings, Islamic art used painted tiles, from as early as 862-3 (at the Great Mosque of Kairouan in modern Tunisia), which also spread to Europe. According to John Ruskin, the Doge's Palace in Venice contains "three elements in exactly equal proportions — the Roman, the Lombard, and Arab. It is the central building of the world. ... the history of Gothic architecture is the history of the refinement and spiritualisation of Northern work under its influence". Islamic rulers controlled at various points parts of Southern Italy and most of modern Spain and Portugal, as well as the Balkans, all of which retained large Christian populations. The Christian Crusaders equally ruled Islamic populations. Crusader art is mainly a hybrid of Catholic and Byzantine styles, with little Islamic influence, but the Mozarabic art of Christians in Al Andaluz seems to show considerable influence from Islamic art, though the results are little like contemporary Islamic works. Islamic influence can also be traced in the mainstream of Western medieval art, for example in the Romanesque portal at Moissac in southern France, where it shows in both decorative elements, like the scalloped edges to the doorway, the circular decorations on the lintel above, and also in having Christ in Majesty surrounded by musicians, which was to become a common feature of Western heavenly scenes, and probably derives from images of Islamic kings on their diwan. Calligraphy, ornament and the decorative arts generally were more important than in the West. The Hispano-Moresque pottery wares of Spain were first produced in Al-Andaluz, but Muslim potters then seem to have emigrated to the area of Christian Valencia, where they produced work that was exported to Christian elites across Europe; other types of Islamic luxury goods, notably silk textiles and carpets, came from the generally wealthier eastern Islamic world itself (the Islamic conduits to Europe west of the Nile were, however, not wealthier), with many passing through Venice. However, for the most part luxury products of the court culture such as silks, ivory, precious stones and jewels were imported to Europe only in an unfinished form and manufactured into the end product labelled as "eastern" by local medieval artisans. They were free from depictions of religious scenes and normally decorated with ornament, which made them easy to accept in the West, indeed by the late Middle Ages there was a fashion for pseudo-Kufic imitations of Arabic script used decoratively in Western art. Romanesque art developed in the period between about 1000 to the rise of Gothic art in the 12th century, in conjunction with the rise of monasticism in Western Europe. The style developed initially in France, but spread to Christian Spain, England, Flanders, Germany, Italy, and elsewhere to become the first medieval style found all over Europe, though with regional differences. The arrival of the style coincided with a great increase in church-building, and in the size of cathedrals and larger churches; many of these were rebuilt in subsequent periods, but often reached roughly their present size in the Romanesque period. Romanesque architecture is dominated by thick walls, massive structures conceived as a single organic form, with vaulted roofs and round-headed windows and arches. Figurative sculpture, originally colourfully painted, plays an integral and important part in these buildings, in the capitals of columns, as well as around impressive portals, usually centred on a tympanum above the main doors, as at Vézelay Abbey and Autun Cathedral. Reliefs are much more common than free-standing statues in stone, but Romanesque relief became much higher, with some elements fully detached from the wall behind. 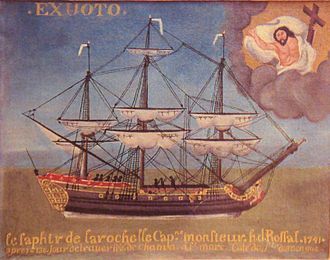 Large carvings also became important, especially painted wooden crucifixes like the Gero Cross from the very start of the period, and figures of the Virgin Mary like the Golden Madonna of Essen. Royalty and the higher clergy began to commission life-size effigies for tomb monuments. Some churches had massive pairs of bronze doors decorated with narrative relief panels, like the Gniezno Doors or those at Hildesheim, "the first decorated bronze doors cast in one piece in the West since Roman times", and arguably the finest before the Renaissance. Most churches were extensively frescoed; a typical scheme had Christ in Majesty at the east (altar) end, a Last Judgement at the west end over the doors, and scenes from the Life of Christ facing typologically matching Old Testament scenes on the nave walls. The "greatest surviving monument of Romanesque wall painting", much reduced from what was originally there, is in the Abbey Church of Saint-Savin-sur-Gartempe near Poitiers, where the rounded barrel vault of the nave, the crypt, portico and other areas retain most of their paintings. An equivalent cycle in Sant'Angelo in Formis at Capua in southern Italy by Italian painters trained by Greeks illustrates the continuing predominance of Byzantine style in much of Italy. During the period typology became the dominant approach in theological literature and art to interpreting the bible, with Old Testament incidents seen as pre-figurations of aspects of the life of Christ, and shown paired with their corresponding New Testament episode. Often the iconography of the New Testament scene was based on traditions and models originating in Late Antiquity, but the iconography of the Old Testament episode had to be invented in this period, for lack of precedents. New themes such as the Tree of Jesse were devised, and representations of God the Father became more acceptable. The vast majority of surviving art is religious. Mosan art was an especially refined regional style, with much superb metalwork surviving, often combined with enamel, and elements of classicism rare in Romanesque art, as in the Baptismal font at St Bartholomew's Church, Liège, or the Shrine of the Three Kings at Cologne, one of a number of surviving works by Nicholas of Verdun, whose services were sought across north-western Europe. Stained glass became a significant art-form in the period, though little Romanesque glass survives. 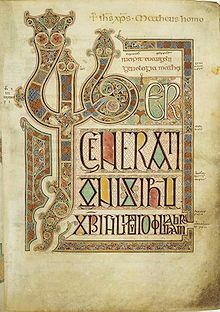 In illuminated manuscripts the bible became a new focus of intensive decoration, with the psalter also remaining important. The strong emphasis on the suffering of Christ and other sacred figures entered Western art in this period, a feature that strongly distinguishes it from both Byzantine and classical art for the remainder of the Middle Ages and beyond. The Gero Cross of 965-970, at the cusp of Ottonian and Romanesque art, has been called the first work to exhibit this. 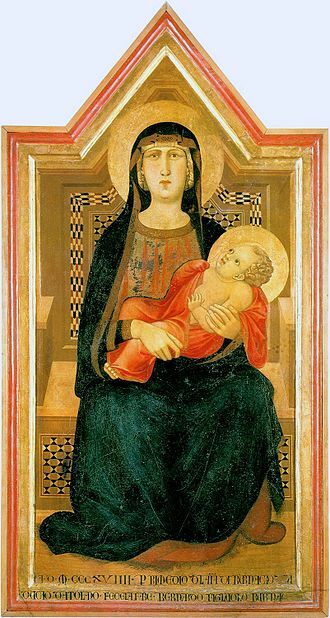 The end of the Romanesque period saw the start of the greatly increased emphasis on the Virgin Mary in theology, literature and so also art that was to reach its full extent in the Gothic period. 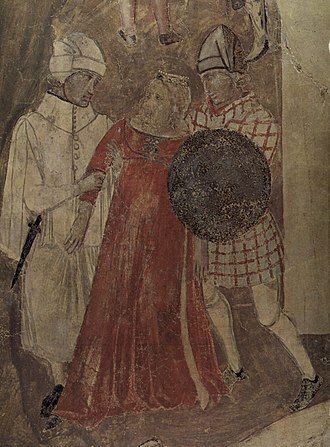 The 12th-century frescos in St Botolph's Church, England, are part of the 'Lewes Group' of Romanesque paintings created for Lewes Priory. 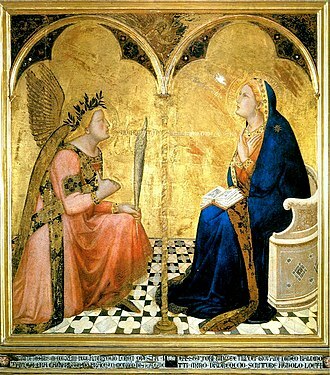 The invention of a comprehensive mathematically based system of linear perspective is a defining achievement of the early-15th-century Italian Renaissance in Florence, but Gothic painting had already made great progress in the naturalistic depiction of distance and volume, though it did not usually regard them as essential features of a work if other aims conflicted with them, and late Gothic sculpture was increasingly naturalistic. In the mid-15th century Burgundian miniature (right) the artist seems keen to show his skill at representing buildings and blocks of stone obliquely, and managing scenes at different distances. But his general attempt to reduce the size of more distant elements is unsystematic. Sections of the composition are at a similar scale, with relative distance shown by overlapping, foreshortening, and further objects being higher than nearer ones, though the workmen at left do show finer adjustment of size. But this is abandoned on the right where the most important figure is much larger than the mason. Medieval art had little sense of its own art history, and this disinterest was continued in later periods. 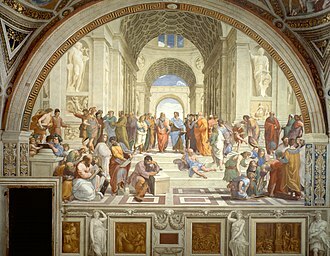 The Renaissance generally dismissed it as a "barbarous" product of the "Dark Ages", and the term "Gothic" was invented as a deliberately pejorative one, first used by the painter Raphael in a letter of 1519 to characterise all that had come between the demise of Classical art and its supposed 'rebirth' in the Renaissance. 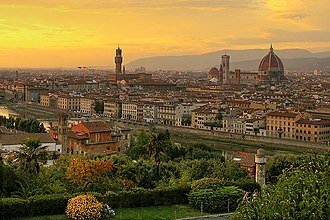 The term was subsequently adopted and popularised in the mid 16th century by the Florentine artist and historian, Giorgio Vasari, who used it to denigrate northern European architecture generally. 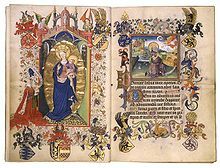 Illuminated manuscripts continued to be collected by antiquarians, or sit unregarded in monastic or royal libraries, but paintings were mostly of interest if they had historical associations with royalty or others. The long period of mistreatment of the Westminster Retable by Westminster Abbey is an example; until the 19th century it was only regarded as a useful piece of timber. But their large portrait of Richard II of England was well looked after, like another portrait of Richard, the Wilton Diptych (illustrated above). As in the Middle Ages themselves, other objects have often survived mainly because they were considered to be relics. Franz Theodor Kugler was the first to name and describe Carolingian art in 1837; like many art historians of the period he sought to find and promote the national spirit of his own nation in art history, a search begun by Johann Gottfried Herder in the 18th century. Kugler's pupil, the great Swiss art historian Jacob Burckhardt, though he could not be called a specialist in medieval art, was an important figure in developing the understanding of it. Medieval art was now heavily collected, both by museums and private collectors like George Salting, the Rothschild family and John Pierpont Morgan. 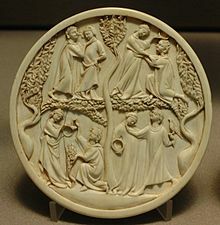 During the Middle Ages some Christian art was used as a way to express prejudices and commonly held negative views that were held against other religions and groups of people. In Medieval Europe between the 5th and 15th century many Christians viewed Jews as enemies and outsiders due to a variety of factors. They also tended to hate them for being both culturally and religiously different as well as because of religious teachings that held negative views of Jewish people such as portrayals of the Antichrist as Jewish. The Jewish people's economic position as moneylenders, coupled with royal protections that were given to them,[example needed] created a strained relationship between Jews and Christians. This strain manifested itself in several ways, one of which was through the creation of antisemitic and anti-Judaism art and propaganda that served the purpose of discrediting both Jews and their religious beliefs as well as spreading these beliefs even further into society. Late medieval images of Ecclesia and Synagoga represented the Christian doctrine of supersessionism, whereby the Christian New Covenant had replaced the Jewish Mosaic covenant Sara Lipton has argued that some portrayals, such as depictions of Jewish blindness in the presence of Jesus, were meant to serve as a form of self-reflection rather than be explicitly anti-Semitic. 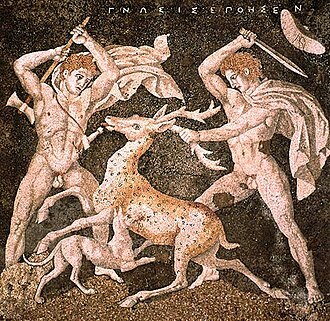 In her 2013 book Saracens, Demons, and Jews, Debra Higgs Strickland argues that negative portrayals of Jews in medieval art can be divided into three categories: art that focused on physical descriptions, art that featured signs of damnation, and images that depicted Jews as monsters. Physical depictions of Jewish people in medieval Christian art were often men with pointed Jewish hats and long beards, which was done as a derogatory symbol and to separate Jews from Christians in a clear manner. This portrayal would grow more virulent over time, however Jewish women lacked similar distinctive physical descriptions in high medieval Christian art. Art that depicted Jewish people in scenes that featured signs of damnation is believed to have stemmed from the Christian belief that Jews were responsible for the murder of Christ, which has led to some artistic representations featured Jews crucifying Christ. Jewish people were sometimes seen as outsiders in Christianity dominated societies, which Strickland states developed into the belief that Jews were barbarians, which eventually expanded into the idea that Jewish people were monsters that rejected the "True Faith". Some art from this time period combined these concepts and morphed the stereotypical Jewish beard and pointed hat imagery with that of monsters, creating art that made the Jew synonymous with a monster. 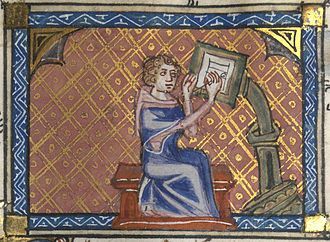 Wikimedia Commons has media related to Medieval art. ^ Holcomb, Barbara Drake; Holcomb, Melanie (June 2008). "Jews and the Arts in Medieval Europe". Metropolitan Museum of Art. Retrieved 2017-11-28. ^ Mittman, Asa Simon; Dendle, Peter J. (2013). The Ashgate Research Companion to Monsters and the Monstrous. Ashgate Publishing, Ltd. p. 383. ISBN 9781472418012. ^ Lipton, Sara (2014-11-04). Dark Mirror: The Medieval Origins of Anti-Jewish Iconography. Macmillan. p. 5. ISBN 9780805079104. ^ Lipton, Sara (2008). "Where Are the Gothic Jewish Women? On the Non-Iconography of the Jewess in the Cantigas de Santa Maria". Jewish History. 22 (1/2): 139–177. doi:10.2307/40345545. JSTOR 40345545. ^ Strickland, Debra Higgs (2003). Saracens, Demons, & Jews: Making Monsters in Medieval Art. Princeton University Press. p. 99. ISBN 0691057192. ^ a b Strickland, Debra Higgs (2003). Saracens, Demons, & Jews: Making Monsters in Medieval Art. Princeton University Press. pp. 241–247. ISBN 0691057192. Lasko, Peter (1972), Ars Sacra, 800-1200 (nb, 1st ed. ), Penguin History of Art (now Yale), ISBN 978-0-300-05367-8 . Santa Sabina, Rome, interior (5th century). The royal palace, later church, of Santa María del Naranco, an example of Asturian architecture of the Ramirense period. The interior of the Church of São Pedro da Lourosa (Lourosa, Portugal). Church of St. Margaret of Antioch, Kopčany (Kopčany, Slovakia, 9th–10th century).